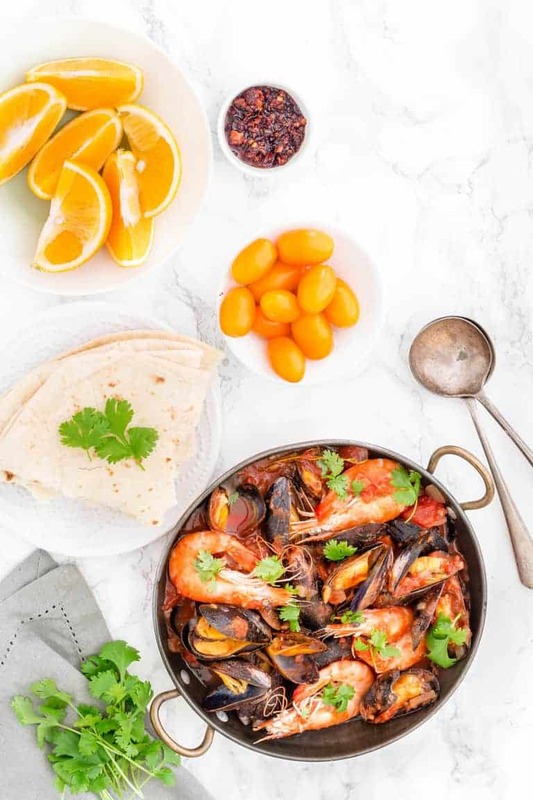 This Prawn and Mussels Rougaille, is a classic Mauritian recipe which is a richly flavoured tomato sauce that combines Creole cuisine flavours like onions, thyme, garlic and chillies. I am starting to think that my recipe work is purely holiday led. So, if I wake up in the morning and start dreaming about going to Sierra Leone, then I will whip up an African recipe. A few weeks back Sri Lanka was the flavour of the day – hence a Sri Lankan inspired curry. Last week it was Mauritius, so a Mussels and King Prawn Rougaille (a classic Mauritian Recipe) it had to be. Especially as I pretty much had everything on hand to make the Rougaille. Rougaille, is a classic Mauritian recipe. Basically, it is richly flavoured tomato sauce combining Creole cuisine flavours like onions, thyme, garlic, chillies, and well, of course, touches that are personal to each family. The Rougail Saucisse works well with meat, fish, paneer or eggs so can be adapted to different dietary requirements. This version of Mauritian Fish Rougaille is so very good. Step 1. Fry the onion and pepper until soft. Step 2. Then stir in the garlic, ginger, chilli, thyme and half the coriander and cook for a couple of mins until nice and fragrant. Step 3. Then pour in the chopped tomatoes and vegetable stock and simmer for 20 mins, till nice and thick. This is now your basic Rougaille sauce. You can add other veggies or protein here as you choose. Step 4. 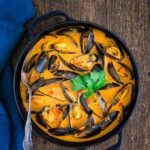 Add in the mussels and cook for 2 mins, before also adding in the prawns for a further 2-3 mins until they are cooked through. This time I served the Mussels and Prawn Gougaille with some flatbreads and lots and lots and lots of sweet juicy yellow baby plum tomatoes. 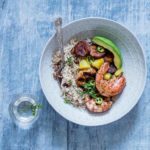 You can also serve it with this Gluten Free Instant Pot Brown Rice. Simple and so very good. Have you tried a Seafood Rougaille? Have you ever tried Mauritian food? Did you enjoy it? What was your favourite dish? 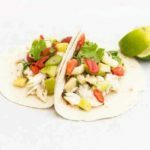 For more Mauritian recipes why not check out this Coconut Encrusted Pineapple and Fish Kebabs with Mango Salsa recipe. It is so, so worth it. 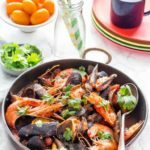 Here is how to make Mauritian Prawn and Mussels Rougaille recipe. Please do try it and if you do make it then please do tag #recipesfromapantry on Instagram or Twitter so that I can pop over and have a look. It is really, really awesome for me when you make any one of my recipes. You can also share it on my Facebook page. Thank you for reading my Rougail Saucisse recipe post. And please come visit again as I continue dreaming up recipes, traditional African recipes, African fusion recipes, Sierra Leone recipes, travel plans and much more for you. Originally published in Feb 2017, updated Jan 2018. Don't forget to tag #recipesfromapantry on Instagram or Twitter if you try Mussels and King Prawns Rougaille! It is really, really awesome for me when you make one of my recipes and I'd love to see it. You can also share it on my Facebook page. Please pin this recipe to Pinterest too! Thank you for reading Recipes from a Pantry. Heat the oil in a large frying pan over low-medium heat, add the onion and pepper and fry for up to 10 minutes until the onion is soft. Stir in the garlic, ginger, chilli, thyme and half the coriander and cook for a couple of minutes. Then pour in the chopped tomatoes and vegetable stock, bring to the boil, reduce the heat and simmer for 20 minutes, stirring occasionally. Add in the mussels and cook for 2 minutes, before also adding in the prawns. Cook for a further 2-3 minutes until the both the mussels and prawns are cooked through. Serve with rice, rotis and a salad. The Rougail Saucisse works well with meat, fish, paneer or eggs so can be adapted to different dietary requirements. I love king prawn and this dish reminds me so much of my trip to Spain. I saw all these amazing flavors in the paella that I ate. This looks delicious and I can almost imagine the smell! I love all the flavors used in the dish and that it can be used with many foods 🙂 I bet with eggs would also be good. 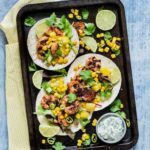 I need to make this – all flavours I love! Wow this looks great! I’ve never made mussels before, but I get offered them sometimes when we are near the ocean. I’ll have to take some next time so I can try your recipe. I can smell the aroma thru the screen. Swooning, here!!! Really like the sound of all the summery flavours in this. 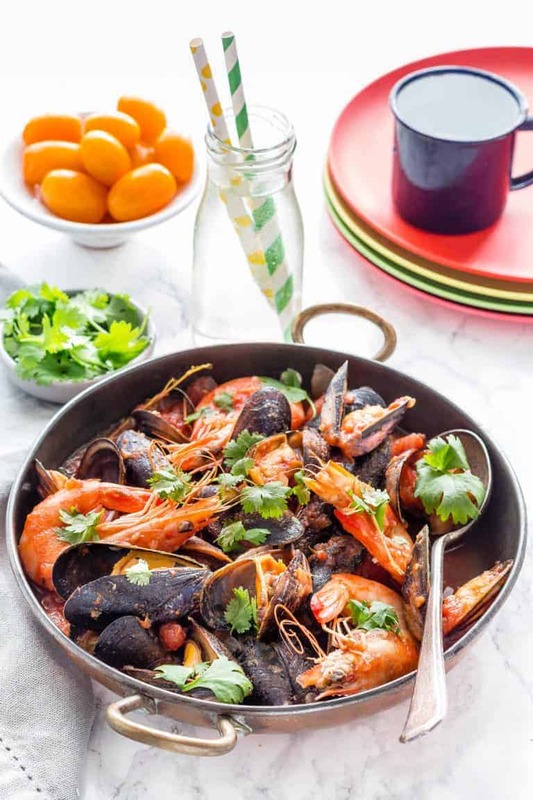 I am a fan of seafood so this pan packed with prawns and mussels looks like a true heaven to me! Lovely to make dishes associated with different countries, certainly to fit your mood and tastes. This rougaille looks wonderful, and with tasty ingredients, sounds delicious. A rather special looking meal that would be fabulous to make for dinner guests. I really can’t wait to try this recipe, it uses all my favourite flavours and ingredients! I am from Sri Lanka and cannot wait to see what you made from there (guess am gonna have to stalk out your blog) as for this – it looks delicious – so flavorful! I love Mauritian cooking so much! This Rougaille looks incredible paired with the flatbread. Such wonderful flavors!